I know some readers may get the idea that I'm leaving contemporary art behind and diving into folk and self-taught art given some of my recent posts. These are long-time interests of mine, but I don't often get the opportunity to write about them. When I learned that a new quilt show was opening in La Grange, I figured I'd check it out and continue this exploration of folk art. Except that this exhibit, Art Quilts from the John M. Walsh III Collection (showing at the Texas Quilt Museum in La Grange through December 31), is not really a folk art exhibit. Almost all of the quilts made in this exhibit were 1) made by artists who received specialized art educations, and 2) made exclusively for display, not to put on a bed. My knowledge of quilts is quite limited. I don't know who started making quilts, or when the quilted blankets that we usually think of when we hear the word "quilts" became popular. My grandmother made beautiful quilts. I know quilting is often a collective, communal activity (quilting bees). I have a feeling that it is traditionally rural, but I don't know that for sure. I have that impression because my grandmother was a very rural person. I know that the designs on quilts are abstract and geometric, which is one aspect of them that has always appealed to me. I know that they are often made with scrap fabric--worn out clothes, for example, or left-over fabrics that are too small to be used for anything else. This recycling aspect also appeals to me. Quilting is something you learn from someone else, often an elder. Given my limited understanding of the world of quilts, the quilts in this show were quite a departure. 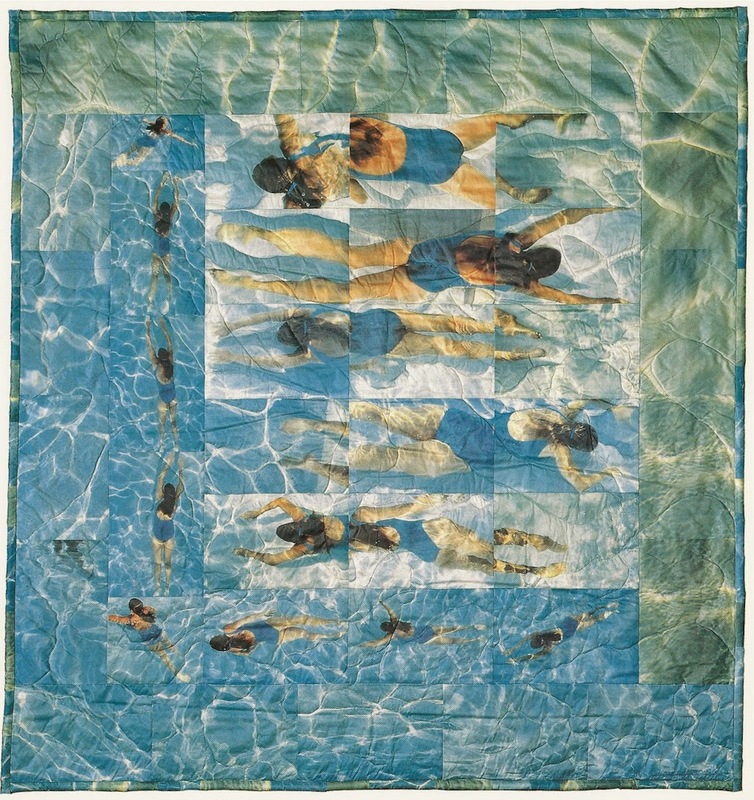 We can see that with Catherine McConnell's Vermost Swimmers, which is constructed like a traditional quilt--the top layer is constructed of a variety of patches sewn onto the batting and bottom layer. But instead of being "scrap", these patches are photographic heat transfers. I think it's quite lovely, but part of me asks why it's a quilt in the first place. This could have been a photocollage on paper, for example. Of course, when you see Vermont Swimmers in person, you can see the puffiness of the batting. You see it hanging--not stretched or mounted. So it's slightly different than it would be if it were produced on some other kind of material. Also, you are seeing it in a quilt show. I don't know anything about McConnell (she hardly exists online), but if she identified herself as a quilter, that's reason enough for this to be a quilt instead of something else. And if you are a quilter in 1991, you have the choice to avail yourself of whatever technology and subject matter you want--you don't have to imitate quilts from the 19th century. That's the attitude of the artists in this show. I sometimes think of quilting as sewing scraps together, but the definition of quilting has to do with binding three layers--top, batting and bottom--together with stitching. 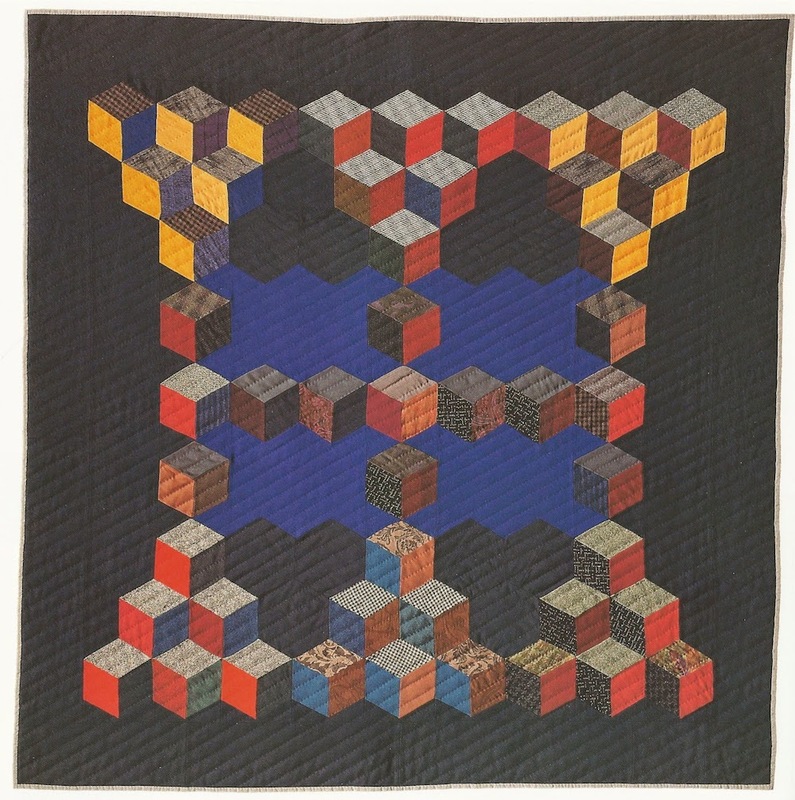 Lenore Davis (died 1996) used a single piece of velvet as the top part of this quilt. 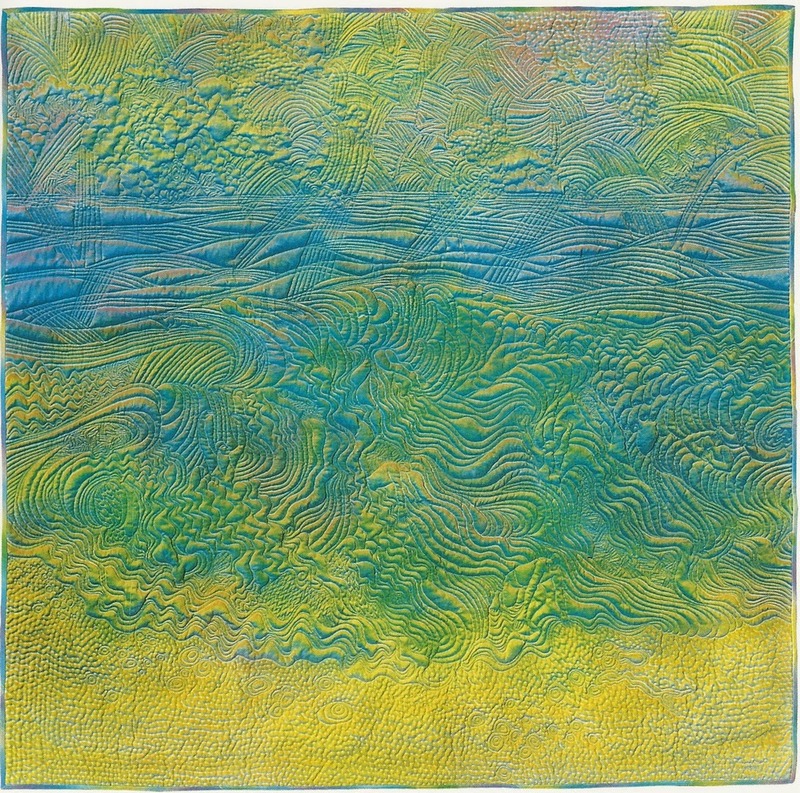 Then using Procion dye (which you may have used if you've ever made tie dye clothes), she painted the quilted design. I'm guessing that she used an airbrush because she seems to have hit the raised quilted shapes from the edge. The effect is quite striking. Part of me prefers the traditional geometric quilts, and many of the artists in this exhibit hearken to that tradition. Rebecca Shore honors the tradition, but she is a highly trained artist (a graduate of and adjunct professor at SAIC) who has gallery representation and works in a variety of media, including very traditional ones like painting. So while she may have been thinking of traditional quilts, she may have also been thinking of the history of geometric abstraction in modernist painting. In any case, the precision of the image in Night Light feels a little to perfect for my tastes, though. Anna Williams (1927-2010) is apparently the only "unschooled" artist represented in the John M. Walsh III collection, and her biography on KnowLA describes her as "self-taught". 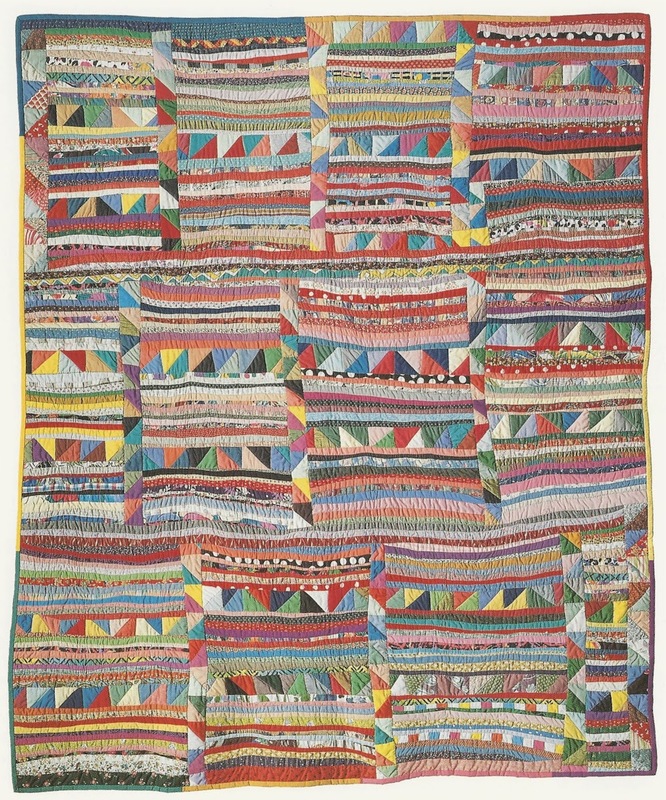 But it also describes her first quilt as one made at age nine, which to me suggest that she had some instruction from an adult--a mother or grandmother or other relative. In any case, her quilt in the show is the closest to what I think of when I think of a quilt, and I like Strings and Triangles best. But this perhaps represents a sentimental, conservative impulse on my part when thinking about this art form. This exhibit was definitely an eye-opener about the possibilities of quilts.